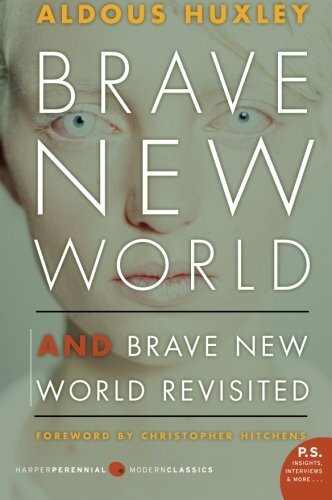 In 1958, author Aldous Huxley wrote what some would call a sequel to his novel Brave New World (1932) but the sequel did not revisit the story or the characters. Instead, Huxley chose to revisit the world he created in a set of twelve essays in which he meditates on how his fantasy seemed to be becoming a reality and far more quickly than he ever imagined. That Huxley's book Brave New World had been largely prophetic about a dystopian future a great distress to Huxley. By 1958, Huxley was sixty-four-years old; the world had been transformed by the events of World War II and the terrifying advent of nuclear weapons. Peeking behind the Iron Curtain where people were not free but instead governed by Totalitarianism, Huxley could only bow to grim prophecy of his friend, author George Orwell, (author of the book 1984). It struck Huxley that people were trading their freedom and individualism in exchange for the illusory comfort of sensory pleasure--just as he had predicted in Brave New World. In 1958, Huxley heard a world that was full of noise--a world of what he called singing commercials that flooded the mass media. Also, he saw people everywhere taking tranquilizers and beginning to surrender to modern life; it was not unlike the soporific drug Soma in his novel. The power of propaganda, he believed, had been validated by the rise of Hitler, and the postwar world was using it effectively to manipulate the masses. Overpopulation was already an issue, and Huxley saw the emergence of an overpopulated world in which chaos ruled and was being countered more and more by centralized control. It was not at all unlike what happens in his book in which the ultimate controlling capitalist of Huxley's early years, Henry Ford, becomes the equivalent of God. Huxley despairs of contemporary humankind's willingness to surrender freedom for pleasure. Huxley worried that the rallying cry, "Give me liberty or give me death" could be easily replaced by "Give me television and hamburgers, but don't bother me with the responsibilities of liberty." Huxley saw hope in education; education that could teach people to see beyond the easy slogans and efficient ends and anesthetic-like influence of propaganda. Writer Aldous Huxley (1894-1963) was an extraordinary man who brought to his work a strong sense of the world into which he was born (amid the rarefied privilege of a distinguished English family), his own probing intelligence, and a restless soul. Huxley's grandfather was the eminent biologist and writer Thomas Huxley, who helped Darwin realize his theory of evolution, and his mother was the niece of poet Matthew Arnold (Huxley's brother Julian also became an esteemed writer and their half-brother Andrew won a 1963 Nobel Prize in physiology). Success came early to Huxley, and he enjoyed poking fun at society's pretensions in some of his satirical novels like Crome Yellow and Antic Hay. The publication of Brave New World in 1932 marked a sea-change for Huxley. Growing maturity had brought him interest in political, philosophical, as well as spiritual matters that form the root of some of his other novels such as Eyeless in Gaza, After Many a Summer Dies the Swan and Time Must Have a Stop.